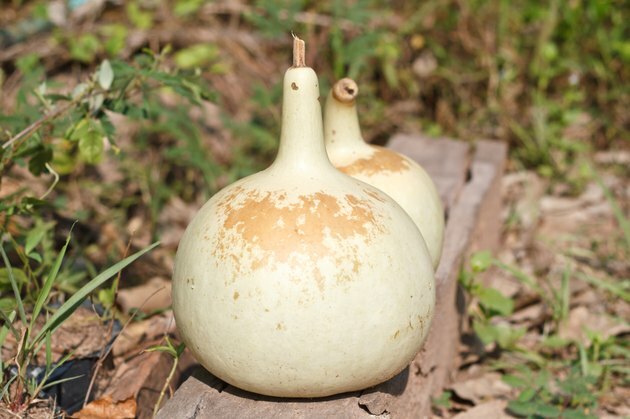 Bottle gourd, also called calabash, is a vine plant that produces an hourglass-shaped fruit similar to a summer squash. The gourd has a high water content, which makes the fruit low in calories. Bottle gourd is technically a fruit, but is often an ingredient in many main dishes, making it more like a vegetable than a fruit. The U.S. Department of Agriculture's Nutrient Database lists a single serving of cooked bottle gourd as 1 cup, or about 5 oz. This squash-like vegetable has a smooth skin and internal seeds that you remove before cooking. Bottle gourd has a bitter taste, so it is best to add it to soup or stir-fry dishes. Bottle gourd is a low-calorie fruit which has 22 calories in each 1 cup cooked serving, about 1 percent of a standard 2,000-calorie diet. Bottle gourd contains a trace amount of fat that contributes to the total calorie content in one serving. The low calorie amount in bottle gourd makes it a good filler to add to main-dish recipes. A single serving of bottle gourd has 5.39 g of carbs. This low-carb value makes bottle gourd a good choice for reducing carbs in your diet. About 1.25 g of fiber contributes to the total carb content of bottle gourd. The fiber content in the fruit helps regulate your digestive system and control blood sugar levels. One serving of bottle gourd contains a trace amount of fat, about 0.03 g for 1 cup of cooked gourd, with less than 1 g of protein per cup. Adding bottle gourd to a recipe or cooking it in oil will increase the fat content of the dish. Bottle gourd has 35 mg of calcium, 248 mg of potassium and12.4 mg of vitamin C in each 1-cup serving. The fruit is low in sodium, with 3 mg in each serving. The sodium content increases if you season the dish with salt or other seasonings that contain sodium.